First of all, I can’t believe it is June! I’m pretty sure we were just watching the ball drop on New Year’s Eve like yesterday. Anyone else feel the same? Time goes so fast! Anyway, I digress. Since it’s June, it is time to start thinking about Father’s Day! My husband and I don’t usually buy each other gifts for Mother’s Day or Father’s Day, so this year my little one and I are going to make him something at home. I don’t know about you but we LOVE arts and crafts here at my house. Like, we are a little obsessed. But just a little bit. For me, receiving something that you can tell took time, creativity and thought means more than a gift bought at a store ever could. I mean, it’s nice to get a necklace now and then but, you get my point. My daughter and I are so excited to get started on one or two of the adorable projects that we found! Now, unfortunately, I can’t tell you exactly which one(s) we are going to make because my better half reads my blog (he’s so supportive and probably reading this right now!) and I don’t want him to know what he is getting. So, if you are like us and are looking for a cute gift to make someone for Father’s Day then stick around and check out a round up of some of the best ideas I came across on my search! You guys, this is quite possibly the cutest thing I have ever seen. If your husband or significant other wears work boots or is in the military, this gift would be perfect for them! One thing that I love about this project is that you have full reign to change the colors, design, etc to fit your family. Definitely on the top of the list! 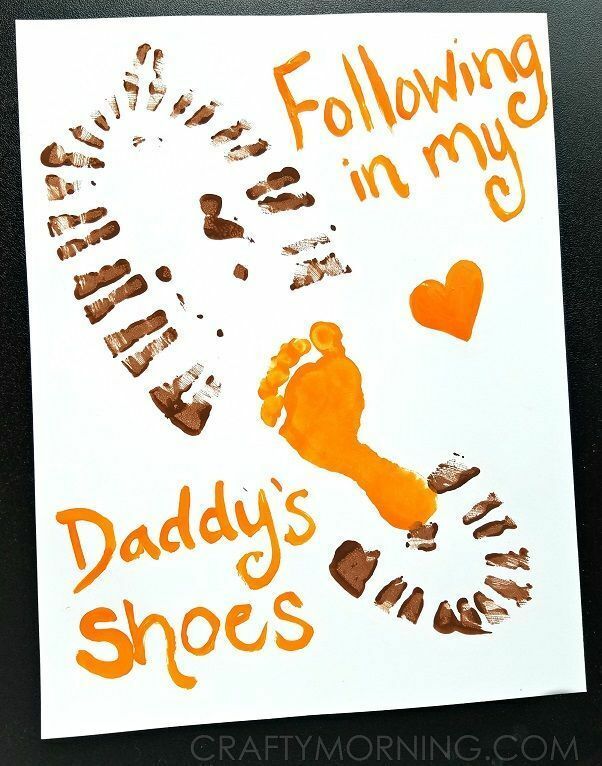 If your little ones are preschool age, this is such a cute craft for Father’s Day. You can do the cutting out, writing, etc for your kids and they can have fun putting their handprint in there! Creative and something Dad can keep for years! Okay, I have been eyeing these printables for years and for some reason have never done them with my daughter. If you have ever seen these online, the answers that kids give are literally amazing and so funny. If you need a quick gift this year, grab this, print it out and let the little ones answer the questions and draw a portrait of him. If the man in your life is a golfer, then you HAVE to give him this gift! My husband loves to golf and he would love this idea for a Father’s Day gift. This is something that he will use, he can keep the bag as a memento and it won’t break the bank to make! Homemade. Only requires six ingredients. All natural. Have we hit the jackpot with this one? Your little ones would have so much fun helping you whip up this shaving cream in the kitchen for Father’s Day! I am seriously in love with this DIY frame and photo! The frame can easily be made with scrap wood, there are directions if you follow the link, and the photo can be taken and printed out right at home. I really love that you made each part of this gift and it is something that can be used again and again with different pictures in it! Last but not least is this adorable wooden sign that can be given to Dad for Father’s Day but hung up all year round! Again, using some scrap wood you may have at home or can easily purchase at the store, you can stain the wood however you want and decorate it with the words or phrases that you love! Dad will love this! Which one do you think my daughter and I are making this year?? Which one would you choose? ?